Last month I covered the return of Sunlit, the iOS photo blogging app from Manton Reece that works with Micro.blog and blogging platforms like WordPress. Reece is back with another iOS app that’s aimed at bringing microcasting, which is short-form podcasting, to Micro.blog. Wavelength is an end-to-end solution for recording, editing, and publishing audio using nothing but an iPhone. It’s an interesting approach to podcasting designed to lower the barriers to entry by simplifying the workflow, while also creating new uses for Micro.blog. Getting started with Wavelength couldn’t be easier. The app launches into an episodes view with nothing but record and settings buttons along with a list of any prior recordings you’ve made. The app works with the iPhone’s internal microphone but also supports external mics. In my tests, I tried both the iPhone X’s built-in microphone and the Shure MV88 microphone that plugs into the iPhone’s lightning connector. It’s not surprising that the Shure mic created the best sounding recordings, but the iPhone’s microphone worked better than I expected. The settings view is where you connect Wavelength to Micro.blog. Hosting a microcast adds $5/month to a Micro.blog subscription for a total of $10/month. Episodes, which are meant to be short, are limited to 20MB files, but there is no limit on the number of episodes that can be uploaded or the bandwidth used. The settings view is also where you can log into an Auphonic account, which is a web service that will clean up your audio tracks when you’re finished editing them. Auphonic has free and paid tiers, and with Wavelength, you can upload your microcast from within the app. After a short time, the processed audio is downloaded back into Wavelength ready for publishing. Adding audio clips, clips from an episode, and preparing an episode for publication. Finished recordings are listed in chronological order in the episodes view. 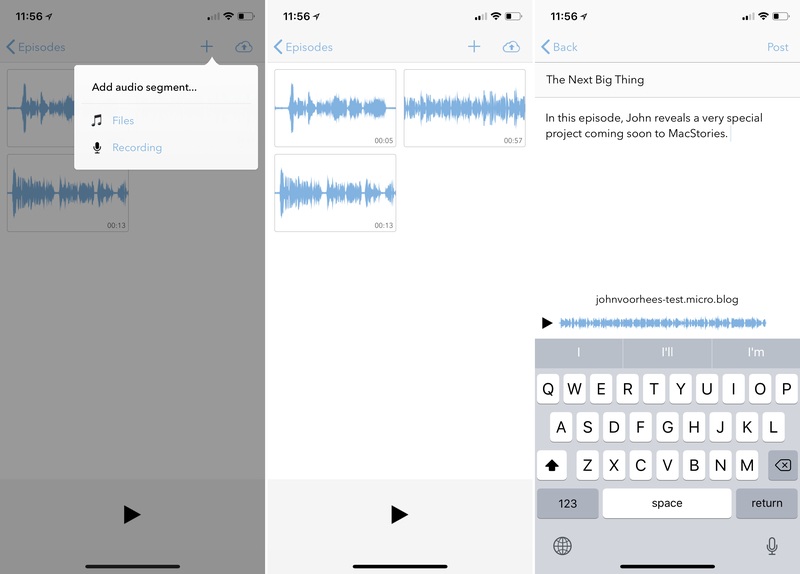 Tapping on an episode takes you to the editor where you can preview your recording, make basic edits, record additional audio snippets, and import audio from the iOS document picker. Once you have all your audio snippets recorded or imported into an episode, they can be dragged into whatever order you’d like and individually edited. The editing tools are accessed by tapping on a track, which zooms into its waveform. There are two levels of zoom, a play button to preview a clip, and a button with a scissors icon for splitting a track into two parts. Swiping back and forth moves the playhead position. Tracks can also be deleted in this view. When you’re finished, tapping the upload button combines your audio clips, uploads them to Auphonic for processing, and returns the final product. Before posting to Micro.blog, you can add a title and show notes. There’s no need to add artwork because Wavelength uses your Micro.blog avatar. In addition to embedding a player in your Micro.blog timeline, the service creates a feed that can be submitted to iTunes to add you microcast to its podcast directory. My favorite part about Wavelength is how easy it makes creating a podcast. The app isn’t going to replace a fully-featured iOS audio editor like Ferrite, but that’s not the point. 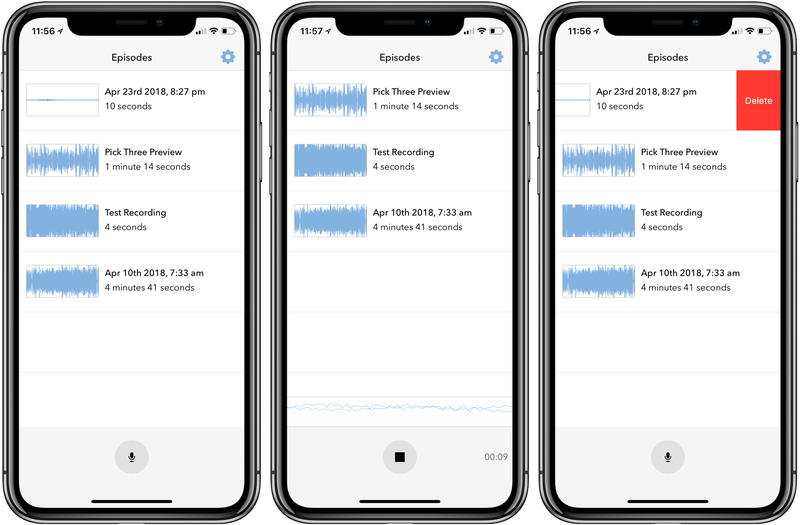 By packaging a podcasting workflow into a single iPhone app, Wavelength makes what can be a fiddly process accessible to more people. It reminds me a little of Anchor, but with a business model that covers its hosting costs and greater feed portability because its based on open web standards. Still, there are some additions I’d like to see made to Wavelength that I don’t think would compromise its streamlined approach. For instance, show notes don’t support links currently. Also, a templating system that would allow for the inclusion of intro music in every episode produced would be handy. A by-product of Wavelength is that it also makes a case for why someone might want to try Micro.blog. The service sits at an interesting crossroads between social networks and blogging platforms incorporating elements of each. With Sunlit and Wavelength, Reece answers the question of what Micro.blog is good for by putting tools in the hands of users that allow them to answer the question for themselves. If you’ve ever wanted to experiment with podcasting, but didn’t know where to start, Wavelength is an excellent entry point. Give it a try, find your voice, and evolve your show as you learn. With a free app and only $5/month to share your creation with the world, Wavelength makes taking that first step easier than ever. Wavelength is available on the App Store.